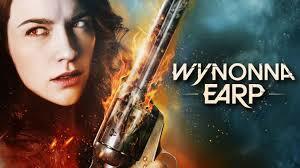 Wynonna Earp is back! And we need to deal with the important things first! Waverley - that hair is tragic. But not as tragic as Jeremy’s moustache. No, Jeremy, no. The gang is all together hunting Revenants with sniper rifles, a mechanical bull, lots of alcohol and wit and one liners. They want information about Bulchar, this season’s big bad and the one who cursed the Earps in the first place. There’s a lot of angst though. Wynonna and Doc are not quite talking because of their missing baby Alice they had to give up last season. Doc is ignoring all of this and avoiding Wynonna while pouting and moping. While Wynonna is also avoiding the issue by training extremely hard with Doc and day drinking so much all the while having lots of sexual tension with Doc and, to a lesser extent, Dolls. So the love triangle is still on but kind of ok compared to most shows as there’s a distinct lack of hissing at each other over it. Purple fog also hits Doc’s bar and Jeremy and Doc get glamoured as well (with Jeremy asking the vampire’s thoughts on Twilight). Doc is taken to the stripper bus to be tested by one of the vampires who clearly has history with him. She wants to prove that he’s the real Doc and she’s doing that by torture. This may also be because of their bad history and also because she doesn’t seem to be especially amused by the idea that he’s no longer his hedonistic self and now has friends and stuff. Wynonna also bails from the investigation - to visit her mother. Yes her mother is about - apparently she’s been locked up in a mental institution for some time and it’s been a dark family secret. She hears voices and some of those voices are about Balshur - unfortunately she’s not very coherent so she doesn’t have great information to share. But Wynonna meets Dolls there and he’s happy to get her her mother’s medical records. Or massacre vampires because other than glamouring they apparently have no physical skills and once dead their victims are free of all mind control and can get in with the killing. Lots and lots and lots and lots of killing (and crafty ploys to find out who is glamouring who by yelling “Waverly, who’s your favourite vampire!”). And Nedly declares Purgatory is for the living… mainly. Because this show has all the lines. But Wynonna and Doc have a moment, burying some of their issues and making up - and out. I love that from the opening minutes of this episode, Waverley and Nicole’s relationship is clear and obvious and sexual and loving from the very beginning which is one of the most beautiful things about this show. Waverley and Nicole are never rendered sexless but nor is it fetishistic and nor is their relationship forgotten. In so many of the shows we watch and books we read, LGBTQ identity, if it exists at all and especially for a main character, is something referred to, briefly, rarely shown and often forgotten. I am kind of interested in vampires that seem to have little physical ability - but their glamour is amazing.